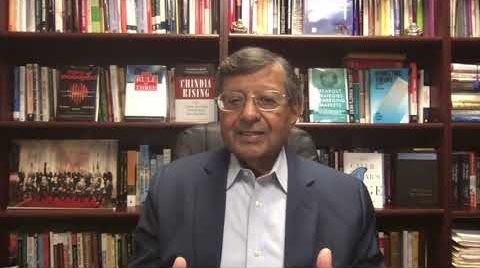 Jagdish N. Sheth and Atul Parvatiyar, Goizueta Business School, Emory University, Atlanta, Georgia, USA | International marketing is undergoing a transformation to become integrated global marketing. The emphasis has shifted from understanding and explaining between- country differences to identifying transnational similarities; and from country-&y-country functional adjustment of marketing mix elements to seeking global cross-functional integration. In this paper, the authors discuss how the contextual factors of international marketing are changing to make between-country differences less relevant for international marketing practice. The emergence of integrated global marketing has a greater potential for theory development in international marketing as it is not contextually bound and thus can be generalized. Ever since Levitt’s (1983) article on globalization of markets, academics and practitioners have debated whether international markets are becoming homogeneous, and if the international marketing paradigm ought to change from highlighting national differences to exploring international similarities (Ghoshal, 1987; Levitt, 1983: Walters, 1986; Wind, 1986). Proponents of global marketing contend that, because market needs are becoming homogeneous, country differences are less relevant to international marketing planning (Samiee and Roth, 1992; Yip, 1989). Yet others assert that the existence of global markets is a myth. They point to the many contradictory trends around the world suggesting stark differences in national markets and hence the need for adaptation and customization of international marketing based on individual country differences (Quelch and Hoff, 1986; Douglas and Wind, 1987). Despite these arguments and counter-arguments, it is now widely known that the formation of the European Union, North American Free Trade Arrangement (NAFTA), and trading arrangements among Asian and South East Asian Nations (ASEAN) has significantly tilted the debate in favor of global marketing. These supranational arrangements are created to promote global and regional free trade by removing country-specific barriers of market entry and operations, thus providing opportunities to individual companies to derive economies of scale, and to consumers the consequent benefits of global products at lower prices. As trading barriers tumble and in some cases, such as the European Union, capital and labor move freely between member countries, individual country characteristics are no longer different from prevailing intra-country regional characteristics. Thus, market homogeneity is expected to gain prominence with consequent global Consequences of marketing activities. It therefore makes sense to search for global similarities integrated global rather than accentuate the differences across nations. By searching for similarities across nations, marketing offerings can be standardized and hopefully economies of scale achieved. Empirical research has shown that overall corporate performance improved in companies that adopted standardization in their international marketing strategy content (Szymanski 17 et al, 1993). Although standardization of international marketing is implicit in global marketing, the two are not synonymous. Customization and “fine tuning” of international marketing are included in the concept of global marketing (Levitt, 1983; Yip, 1989). Its underlying philosophy is standardization of marketing programs wherever possible, and customization wherever necessary (Cateora and Graham, 1999; Kashani, 1989). Similar to other managerial functions in a global company, global marketing purports to provide an integrated view of marketing opportunities, resources and skills around the world. Essentially, global marketing strives to attain worldwide coordination, rationalization, and integration of all marketing activities including target market selection, product decisions, branding, price, distribution, advertising, packaging, promotion, and sales program, etc. (Douglas and Craig, 1989). Many multinational companies, such as General Electric, IBM Procter & Gamble, Unilever, etc., are transforming themselves to become global companies. They are changing from a “polycentric orientation’ and multidomestic functional management, to what Perlmutter (1969) called the “geocentric orientation” and globally integrated functional management approach. Their manufacturing, procurement, R&D and business operations around the world are being rationalized and they are now attempting to develop integrated global marketing by focusing on global brands and products, global advertising, and global distribution structures. To make such changes companies have to alter their organization structure as well as the roles and responsibilities of country and regional managers. 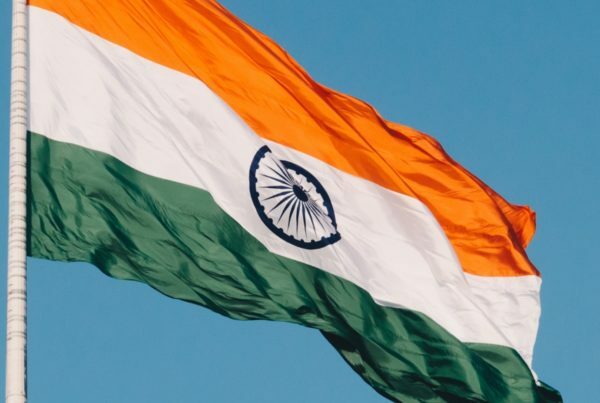 In many cases, the immense autonomy hitherto enjoyed by country managers is curtailed and their responsibilities shift toward supporting integrated global marketing in their territories. Thus, international marketing, as we know it, is being reincarnated into integrated global marketing. In this paper, we discuss the antecedents and consequences of integrated global marketing in their relation to international marketing discipline and its prescriptions. In doing so, we realize that the emerging paradigm of integrated global marketing has a greater potential for theory development than the erstwhile international marketing approach anchored on contextual differences across countries. The rest of the paper is organized as follows. We first discuss the contextual determinants of international marketing and subsequently explain why these contextual determinants are not as relevant anymore to the discipline of international marketing given the forces of globalization. Then, we discuss how the forces of globalization are transforming international marketing into integrated global marketing. Finally, we postulate the consequences of integrated global marketing in their relation to international business practice and research. The discipline of international marketing provides an understanding of marketing practices in different countries (comparative descriptions); its structural determinants anchored to national differences (comparative explanations); and the deployment of country specific marketing strategies and operations by multidomestic firms (comparative prescriptions). Its primary focus is on description, explanation, and managerial control of marketing practices across national boundaries (Toyne 1989). Compared to international trade and export marketing, international marketing is a more recent phenomenon (Root, 1978; Yoshino, 1976). It has grown since World War II and presumably was a consequence of the demise of colonialism and the re-creation of numerous independent nations. In our view, this origin of the rise of international marketing resulted in a number of contextual determinants for its practice and became the focus of academic research and thinking. Figure 1 displays the contextual determinants of international marketing. Numerous books, monographs, and review papers have been written which document how these contextual determinants have shaped the marketing practices between countries (Ohmae, 1985; Porter, 1986a, b, 1990; Kotler, 1991). Therefore, it is better for us to simply focus on a few key points Consequences of with respect to these determinants instead of describing them in detail. The first four determinants (political stability, government policy, ideology-driven economy, and fear of colonialism) are more responsible for the prescription of multidomestic marketing practices; therefore, there exists more anecdotal and trade literature (Ricks et al., 1976) and less academic research on them. This includes such managerial decisions as selection of countries with which to do business and specific entry strategies. Most of this has required the understanding and utilization of what has been recently referred to as the fifth “P” of marketing (politics and public relations). Unfortunately, there is very little theoretical foundation underlying these determinants, partly because international marketing has not borrowed constructs and theories from the social sciences, including political science. Instead it has relied on the framework provided in international business literature, wherein barriers to conducting international business have received considerable attention. However, much of it is based on simply the environmental and policy differences across countries and its consequential impact on the choice of market entry modes and operating strategies. The next three determinants (marketing transfer issues, lack of infrastructure, and North-South dichotomy) need a little more description. Marketing transfer issues relate to the operational challenges of product, price, distribution, and promotion adjustments across national boundaries due to divergence in support and core value chain activities including materials, people, processes and facilities. Its purpose is to understand what market factors, including consumer differences and unavailability of marketing institutions, would pose difficulties to the multinational firm in transferring its successful international marketing programs to other countries. The lack of infrastructure refers to inadequate availability of transportation, communications, physical, financial, natural, and human resources, especially in emerging markets. This lack of infrastructure impacts the adjustment process for the marketing mix as well as the implementation of the marketing program in foreign countries. Finally, the North-South dichotomy refers to the “have” and have-not” countries of the world and is a direct reflection of the traditional economic development theories and their importance to international marketing practices. Academic research related to these three determinants is moderately rich and seems to be grounded in the theories of economic development, logistics and public policy. Finally, most of the academic research in international marketing has been focused on the last two determinants: East-West dichotomy and product life cycles. The first refers to the cultural differences between nations at both a macro and a micro level of understanding and explanation (Clark, 1990). The second refers to the birth and death theories of product life cycles as they move across national boundaries (Johansson and Valhne, 1977; Ayal, 1981; Wells, 1969). Again, the product life cycle concept has benefited from population ecology and biology theories as its basis and, to that extent, it seems to have at Marketing least face validity and empirical support. 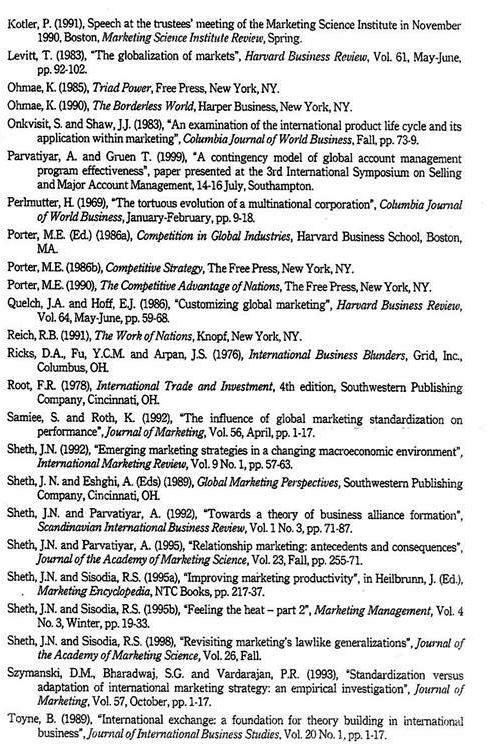 This analysis clearly suggests why international marketing has , predominantly remained a contextual practice and why it has been difficult to develop a theory of international marketing even based upon contingency propositions: most determinants of international marketing are ad hoc, 20 dynamic and unstable and, therefore, not subject to theory building opportunities. For example, who could have forecast the demise of the Soviet Union (political stability), development of regional integrations (European Union), privatization of public sector industries (Japan and the UK) and pro- Western links by Muslim states (Indonesia and Egypt)? The fate of international marketing is closely tied to its determinants. As they change, both the theory and practice of international marketing must change. Ironically, it is not the direction but the existence of most of the determinants that is increasingly under attack. Consequently, the existence of international marketing as we know it today is questionable. A number of powerful macroeconomic forces are reshaping the world. They are: regional integration and the emergence of the triad power, technology advances, especially the adoption of information technologies in business operations; emergence of an ideology-free world and the role of the market economy policy; and the borderless markets as a consequence of global sourcing and global competition. 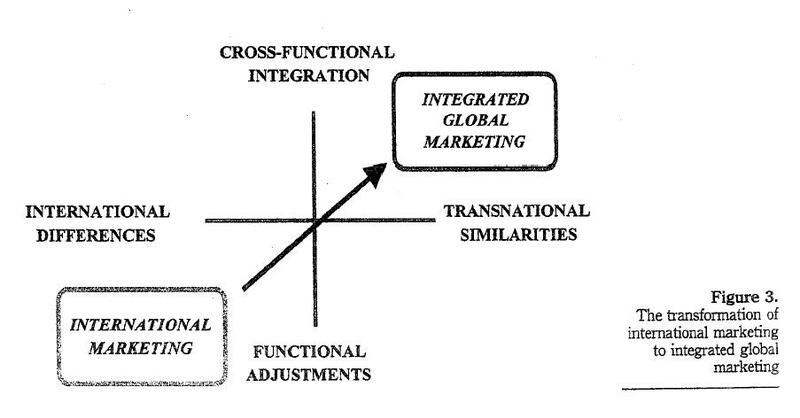 These four major macroeconomic forces are also shaping the determinants of international marketing (Sheth, 1992), and are represented in Figure 2. Together, these forces are creating a borderless world where the national boundaries are becoming either obsolete or less relevant in determining differential marketing practices. As the economic world becomes increasingly borderless for trade, labor mobility, private investment and information, international differences are being supplanted by international differences. In other words, in a borderless economy, within-country differences will surpass between-country differences. Therefore, it may be advantageous to look at different target markets within a country, but on a global basis (Sheth and Eshghi, 1989; Ohmae, 1990). Regional integration is not a new concept. Kings and emperors have practiced it in ancient times and colonial powers in modern times (Kennedy, 1987). In fact, the USA, after the Civil War, created regional integration among all its states, which resulted in several competitive advantages over dominant European nations including the UK, France and Germany. What is new is the emergence of three super economic powers replacing the old model of a single economic superpower ruling the world. Additionally, these superpowers are highly interdependent in their economic activities through mutual presence and mutual trade: the future of one is a lot more dependent upon the future of the others, resulting in the need for greater cooperation and understanding. The regional integration of Western Europe (European Union), Asia and the Southeast Asia (ASEAN), and North American Free Trade Agreement (NAFA) have recently demonstrated that nations can gain more competitive advantages by enduring alliances than by self-reliance or by bilateral trade agreements (Porter, 1990). The emerging economic power of the European Union is, in turn, creating a domino effect on the rest of the world. For example, it encouraged North American regional integration between the USA, Canada, and Mexico and encouraged Japan’s attempted alignment with the ASEAN bloc. The economic blocs of the European Union, ASEAN, and NAFTA have resulted in the emergence of a triad power dominating the world economy. It is estimated that at least 70 percent of world GDP and 75 percent of world trade are concentrated among these three regional economic blocs (Ohmae, 1985). Technology advances, especially in digital electronics and electronic commerce, have revolutionized business processes and practices (Guile and Brooks, 1987; Gerstein, 1987). 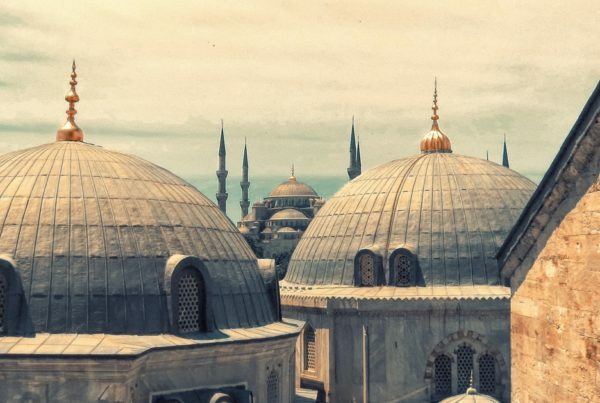 The computerization of people, machinery and physical facilities has literally reshaped the traditional economic concepts of scale, scope and structure. Similarly, the use of telecommunications and information technologies has reduced the time and place barriers of doing business. It is no exaggeration to suggest that the traditional marketing theories based on location (for example, the law of retail gravitation, wheel of retailing, inventory management, logistics, and physical distribution) may be redefined when customers and suppliers could do business at anytime and anywhere. For example, the emergence of the Internet has revolutionized the way we provide information, communication and transactions. It is resulting in disintermediation and reintermediation on a global basis (Sheth and Sisodia, Review 1998). The Internet is fostering global marketing by allowing businesses to connect on a real time basis from anywhere and everywhere in the world. Time zone differences do not matter when connectivity is universal and continuously available. The era of digital electronics is also fundamentally changing global market expansion strategies. In the digital world, product life cycles get considerably shortened and R&D costs mount. Marketers, therefore, must recover their development costs as soon as possible. They do not have the same luxury provided by electro-mechanical technology, wherein new products and technology could be introduced one country at a time, saturating the most developed markets first, and then entering the next most developed market, and so on (Onkvisit and Shaw, 1983). Today marketers have no choice but to introduce products almost concurrently all over the world to ensure that they reach as large a market as soon as possible and before their product and technology become obsolete. Market penetration, and not market skimming, has become the prevailing strategy in global marketing of technological products. A third macroeconomic force is the economic collapse of ideology-driven nations, especially the communist countries. As governments become more pragmatic and less ideology-driven, it is inevitable that many of the traditional beliefs about the role of the market economy and private enterprises will change (Drucker, 1989; Burnstein, 1991). This is resulting in privatization of the public sector, less regulation of many industries, and development of procompetitive policies to encourage innovation and efficiency in different sectors of the economy. This is blurring the distinction between marketing practices of profit versus non-profit entities and industries. Also, significantly different marketing practices across nations that are based on government trade and employment policies are giving way to more market based marketing practices in the future. Finally, and probably as a consequence of the other three macroeconomic forces, we are experiencing globalization of domestic enterprises and economies, primarily through global sourcing and global competition. This is fueled by rapid growth in international trade compared to domestic gross product. 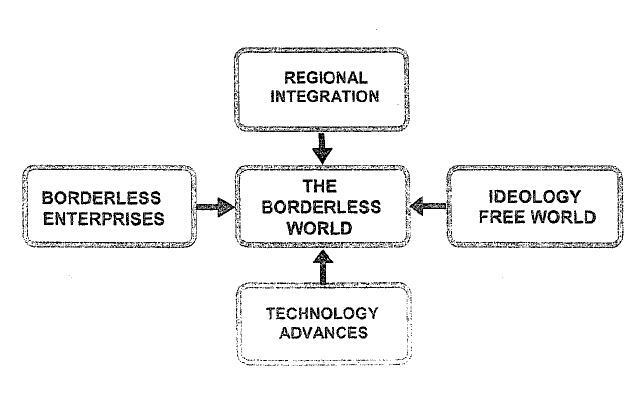 Marketing practices will have to be understood and adjusted to this reality of a borderless enterprise (Ohmae, 1990). Borderless markets emerge when four flows (products, people, money, and information) are driven by market practices without government intervention (Reich, 1991). In a borderless market, marketing practices related to procurement, marketing mix and customers’ understanding are bound to change. As the traditional determinants of international marketing go out of existence, the result is bound to be its demise as we know it today; namely the description, explanation and management of between-country differences in marketing practices (Arndt, 1983). Consequently, significant changes in international marketing discipline and practice are expected. In our opinion, international marketing will be replaced by integrated global marketing and, in the process, will undergo a two-dimensional shift. The first shift to integrated marketing will focus more on cross-functional integration and coordination and less on functional adjustments across national boundaries. The second shift will focus more on transnational similarities for target markets across national boundaries and less on international differences. This is represented in Figure 3. One of the major drivers for integrated marketing on a global basis is the synergistic benefits and productivity improvement potential through integrated marketing (Douglas and Craig, 1989; Sheth and Sisodia, 1995a, b). (1) Worldwide markets. The elitism of the diffusion in innovations from the home country to the rest of the world would be replaced by the concept of worldwide markets. Worldwide market theory is more likely to be developed because it can rely on world demographics. For example, if a marketer targets its products or services to the teenagers of the world, it is relatively easy to develop a worldwide strategy for that segment and draw up operational plans to provide target market coverage on a global basis. This is becoming increasingly evident in soft drinks, 24 clothing, and sports shoes, especially in the emerging world of the Internet economy. (2) Mass customization. The concept of mass customization (Davis, 1987) refers to standard platforms, but custom applications. It breaks the Oxymoron of efficiency of mass production with the effectiveness of personalization of a product or service. Again, it is likely that we will develop a theory of mass customization in marketing that transcends national boundaries. (3) Relationship management. As we move toward a global market economy, it is becoming increasingly necessary to rely on customer and supplier relationships to preempt competition. Business alliances and network relationships help reduce market uncertainties, particularly in the context of rapidly converging technologies and the need for higher amounts of resources to cover global markets (Sheth and Parvatiyar, 1992). Emphasis on relationship management (as opposed to transaction exchange) allows scholars to reduce the impact of unexpected events and, therefore, model more consistent behavior with some well-grounded theories of learning and social exchange (Sheth and Parvatiyar, 1995). (4) Trickle-up theory. Technology advances created by the electronics revolution suggest that it might be best to deploy new technology in low end applications and move up to high end applications. In general, this means starting with global consumer markets and moving up to commercial, industrial and government markets. Market upstreaming becomes highly desirable to gain scale and scope advantages (Christensen, 1998). Earlier differences in world market demand patterns were due to the fact that advanced technological products were primarily developed for the defense and government sectors before being scaled down for consumer applications. Since the buying powers of governments were considerably at variance and national priorities and politics prevailed in government buying, global diffusion of products was not rapid. However, with the adoption of trickle-up theory, worldwide availability of products and services should escalate. As a consequence, we may witness more homogeneity in the demand and usage of consumer electronic products across the nations. (1) Global accounts. 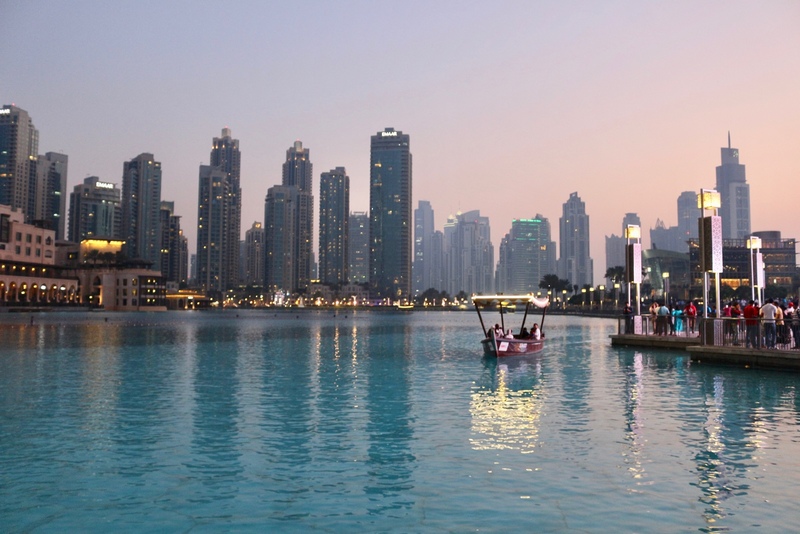 As customers become global and rationalize their procurement activities, they demand vendors to provide them with global services to meet their unique global needs. Often this may comprise global delivery of products, assured supply and service systems, uniform product characteristics, and global pricing. Several companies such as Boeing, Dun & Bradstreet, IBM, Siemens, Xerox, etc. have established global account management programs to address the global needs of their largest customers. Managing global accounts requires cross-functional customer teams and becomes a challenge for both marketing practice and academic research; particularly, when customers have achieved a higher level of global integration compared to the vendor company or when either company is still transitioning to become a global company (Parvatiyar and Gruen, 1999). (2) Cross-functional consistency. As operations get organized around global customer accounts, it becomes increasingly necessary to deploy quality consistency across all functional units. For example the six sigma or zero defect concepts are no longer limited to manufacturing or to line operations, but are extended to all functions, line and staff. A theory of consistency becomes a very viable concept for integrated marketing. (3) Value based costing. Allocation of costs to different functional and business units traditionally has been based upon accepted accounting principles. Unfortunately, they are not so universally accepted, let alone practiced on a global basis. While a recent effort to utilize activity-based costing (ABC) is gaining popularity, the ultimate option may be to develop a matrix that measures value to the market and its attribution to different functional and business units. Since we have some well-accepted concepts of value creation and value distribution in economics and social sciences that transcend national boundaries, it may be possible to generate a unified theory in this area. (4) Networked organization. As international marketing shifts toward global integration, it begins to rely on a network of relationships with external organizations as well as the many internal units of the firm located in various parts of the world. Networked organizations need coordination and communication. The role of marketing changes profoundly — from being an agent of the seller, marketers have to become the agent of the buyer, and from being a marketer of goods and services to being a customer consultant and manager of his or her saleable consumption assets (Achrol and Kotler, 1999). While functional adjustments are dependent upon contextual determinants, cross-functional integration and coordination are capable of transcending ad hoc, context-driven issues to a higher plane of conceptual theory. In other words, it has the potential to be relatively invariant, or at least more stable over time. International marketing discipline, despite its history of several decades, has been relatively unsuccessful in developing well-accepted theories. For example, Albaum and Peterson (1984) concluded that international marketing research has been predominantly opportunistic and devoid of a conceptual framework. 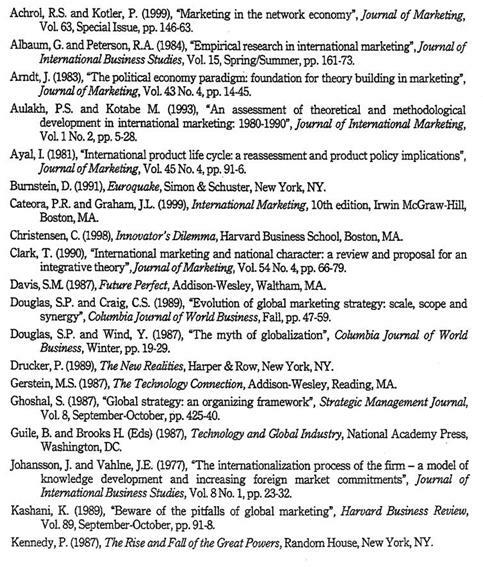 A later review by Aulakh and Kotabe (1993) presents a more positive view, indicating that some advances were made on theory development in international marketing during the decade of 1980s. While some progress has been made, one problem of international marketing as a discipline, and hence its inability to develop well-grounded theories, is that it is anchored on the contextual differences of nations, since the variables are so contextual that generalization and theory development become very difficult. As we have outlined in the transformation of international marketing into integrated global marketing, it is becoming increasingly evident that we can build on well-accepted concepts of economic and social sciences to develop a theory of integrated global marketing. Furthermore, these theories, if grounded on time and distance concepts, may actually add value toward developing a more general theory of marketing. In this paper, we have identified why international marketing has remained a contextual practice devoid of a well-accepted theory. 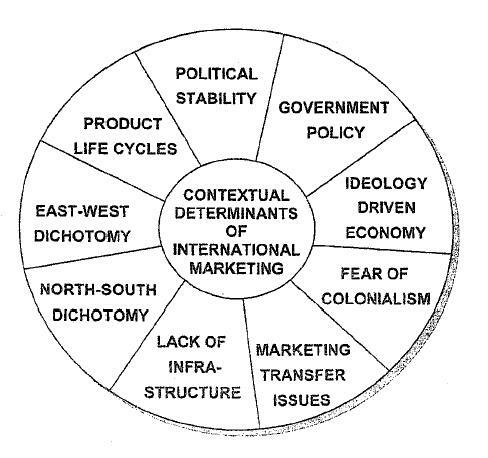 The nine determinants of international marketing (political stability, government policy, ideology-driven economy, fear of colonialism, marketing transfer issues, lack of infrastructure, North-South dichotomy, East-West dichotomy, and product life cycles) are gradually becoming extinct as markets become increasingly borderless. The forces driving a borderless world are: regional integration, an ideology-free world, technology advances, and borderless markets. This is likely to transform international marketing into marketing with less emphasis on functional adjustments across countries due to differences among nations and more emphasis on cross-functional Consequences of integration anchored to transnational similarities. We have identified eight integrated global processes of this transformation: worldwide markets, mass customization, marketing relationship management trickle-up theory, global accounts, cross-functional consistency, value based costing, and networked organization. All these processes of transformation are likely to elevate the practice of marketing from the specifics of the context to a more generalizable theory of integrated global marketing.